Survivor: Edge of Extinction castaway Wendy Diaz was voted out of her Manu tribe but opted to continue in the competition on Extinction Island during the sixth episode of Season 38 on Wednesday night on CBS. Wendy, a 25-year-old small business owner from Los Angeles, CA, who currently resides in Bell, CA, was voted out of the game through a unanimous vote on Night 16 when both Manu and Lesu joined together for one giant Tribal Council session after losing the Immunity Challenge. After the two tribes determined a tie vote -- four votes for Wendy and four votes for Lauren O'Connell, a 21-year-old student at Baylor University from Bakersfield, CA, who currently resides in Waco, TX -- at Tribal Council, everyone decided to team up and vote out Wendy instead of taking a huge risk and drawing rocks. The two tribes thought they permanently ousted Wendy from the competition to win $1 million; however, Wendy opted to stay in the game and wait for an opportunity to possibly play again by traveling to Extinction Island. At the start of the latest Survivor episode, the Manu tribe was comprised of Wendy; Victoria Baamonde, a 23-year-old waitress from Bronx, NY; Gavin Whitson, a 23-year-old YMCA program director from Erwin, TN; and Eric Hafemann, a 34-year-old firefighter from Chicago, IL, who currently resides in Livermore, CA. Wendy was the only former Manu tribe member on this new tribe filled with original Kama members. Lesu had all former Manu members. It was comprised of Lauren; Dan "The Wardog" DaSilva, a 38-year-old law student and former military man from Ossining, NY, who currently resides in Los Angeles, CA; David Wright, a 44-year-old television writer from Philadelphia, PA, who currently resides in Sherman Oaks, CA, and previously appeared on Survivor: Millennials vs. Gen-X; and Kelley Wentworth, a 31-year-old marketing manager from Ephrata, WA, who currently resides in Seattle, WA, and previously appeared on Survivor: San Juan Del Sur and Survivor Cambodia: Second Chance. And Kama was made up of the following five original Kama members: Ron Clark, a 46-year-old teacher at Ron Clark Academy from Chocowinity, NC, who currently resides in Atlanta, GA; Julia Carter, a 24-year-old medical assistant from Hazleton, PA, who currently resides in Bethesda, MD; Aurora McCreary, a 32-year-old divorce lawyer from Pensacola, FL, who currently resides in Orlando, FL; Julie Rosenberg, a 46-year-old toy maker from Baltimore, MD, who currently resides in New York, NY; and Joe Anglim, a 29-year-old multimedia artist from Chandler, AZ, who currently resides in Ogden, UT, and previously appeared on Survivor: Worlds Apart and Survivor Cambodia: Second Chance. The Survivor broadcast began on Day 14 on Extinction Island with Aubry Bracco on the island following her vote-off. Aubry said she was "truly blindsided" in "epic fashion" with a hidden Immunity Idol as well as an extra vote in her pocket. 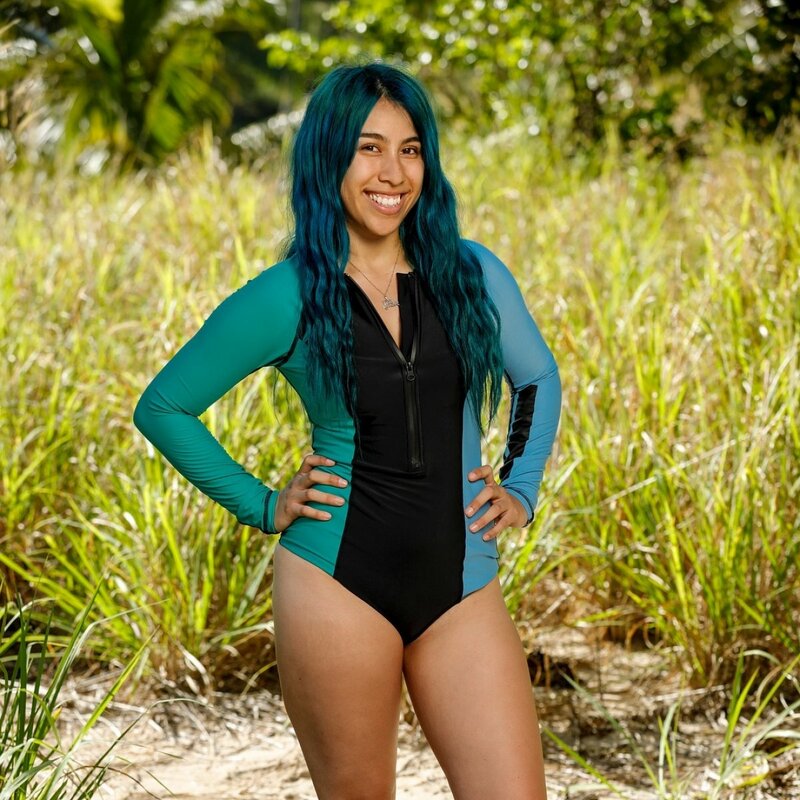 Aubry was stuck with angry people, but she actually loves hitting "rock bottom" in the game because she can only go up from there. Aubry loved pulling herself up from the bottom, and that's exactly what she intended to do. Meanwhile, the three tribes gathered together and met Survivor host Jeff Probst for a Reward Challenge. Everyone was shocked to see Aubry had been voted out of the game, and Kelley, David and Joe seemed especially shocked and/or disappointed. Joe noted Kama wasn't "Kama strong" anymore. The Reward challenge required each tribe to leap over a series of tables, pull a lever to drop sandbags, and then work together to get those sandbags to the finish. Once at the finish, tribe members had to throw the sandbags at targets that would eventually raise a flag. The first tribe to complete the challenge would win Reward in the form of coffee, tea, pastries and cookies. The second-place tribe would receive iced coffee and cookies. Kama sat out Aurora for the challenge since their tribe had one extra member. Joe was on fire hitting the targets, while Gavin did a nice job as well. However, Wardog proved to not be a great thrower. Kama won Reward in first place and then Manu placed second, sending Lesu back to camp with absolutely nothing. Kelley was jealous Kama was on a two-week vacation and the tribe kept winning because they had "Joey The Amazing" playing on their behalf. On Day 14, Kama feasted on some great food and Joe admitted to his tribe this was probably going to put an even bigger target on his back. Since Aubry went home, Joe was pretty upset because he thought he could trust her and he had nowhere to hide and no one to rely on. Joe found it difficult to be a returnee out in the open at all times. Joe had to dig deep and adapt knowing no one really wanted to work with him. Joe didn't have options, but he harnessed support from his family and friends back home to get him through this game. Joe then decided to convince his tribe they were all threats come the merge since they had won so much and so they needed to unite and stick together. Joe was trying to plant in their minds that Kama could use him as a shield going forward because they'd all look like great options. Over at Lesu's camp, Lauren couldn't stop crying because they had no food for days except for rice, which made her very sick. Wardog figured Lauren had given up and so she should be the next person to go. Wardog then approached David and informed him Lauren's mind was not in the game. David therefore agreed to being ride-or-die allies with Kelley and Wardog. Wardog flipping alliances so much, however, scared Kelley. As a result, Kelley vented to David about how Wardog barked orders and played too hard. David said Wardog crunched numbers and strategized constantly but sucked at challenges and did nothing at camp. David was surprised to have found himself working with Kelley, his No. 1 target and "biggest adversary" in the game. On Day 16 at Extinction Island, the players' maps had new holes in them, and so everyone figured there were more goodies to be found. It was a mad scramble to find food or an advantage, and Kevin ended up finding a box along the shore inside the water -- although Reem came up with the idea to look there first. Keith's note read, "When the time comes, penalize your biggest threat by assigning these knots to them." Keith whispered, "Oh, Chris is in trouble," knowing he'd have an advantage in whatever competition was eventually going to come their way. Chris and Reem got into a heated fight after Chris accused her of giving up the advantage to Keith. Aubry said people were "legitimately losing it" and they were the "most dysfunctional" family she had ever seen. Meanwhile, the three tribes met Probst for the next Immunity Challenge of the season. The castaways were instructed to climb a ladder, maneuver a bag attached to a rope through a bamboo frame, use the ball inside to force a cage door open, and then sprint to the finish to solve a Survivor slide puzzle. Ron decided to sit out for the Kama tribe, and then Probst revealed only one tribe would win immunity and the two losing tribes must attend Tribal Council together. Kama solved the puzzle quickly and won the challenge once again, although David and Kelley seemed close to finishing for Lesu. Kama proved to be unstoppable and would, once again, remain intact as a tribe. David was panicking heading into Tribal Council because there were four Lesu and four Manu. They could find themselves at a tie, going to rocks, and David admitted that would be "exhilarating" for a viewer but "nauseating" for a player. After the challenge on Day 16, Wendy announced to her tribe David might flip and vote with them because he was "on a sinking ship" and seemed to be "wormy" in the game. Wendy also thought Wardog might flip. Eric and Victoria also didn't think a returning player would be willing to draw rocks since they want to make it to the end and win so badly. Eric planned to tell Lesu that the Manu tribe was definitely sticking together and willing to draw rocks and so it'd be up to them whether someone would like to make a move. Gavin had 100 percent trust in Eric and Victoria, and he figured Wendy was also going to be tight with them for this vote. Everyone truly was ready to draw rocks except for Victoria, who would do whatever it takes to get one step ahead. Meanwhile, Kelley told her tribemates Manu was probably going to stick together and try to pull someone in with them. She also said Victoria would be a great move because no one on Manu would suspect it. Wardog, however, suggested throwing four votes on Wendy and then when it becomes time for a re-vote, Manu probably wouldn't be willing to draw rocks to save her. Kelley said Wardog was overpowering people once again, but at the same time, he was right because Wendy was not an original Kama member. Kelley anticipated someone on Manu would flip to take Wendy out. Lauren worried she'd be Manu's target and was angry Wardog's "my way or the highway" approach was going to ruin her game. Wardog was then shown questioning whether he'd draw rocks to save Lauren because all she talked about was getting to the merge and eating food. Suddenly, Wardog disappeared and David and Kelley figured he was off in the jungle looking for an idol. David said he was being divisive and the goal was to be united. The tribe attempted to get in Wardog's way of finding an idol, and then Kelley happened to stumble upon a hidden Immunity Idol herself. Kelley told Lauren she had found an idol and then Lauren whispered to her, "I have one too." Lauren then admitted to Kelley she wouldn't draw rocks for Wardog. That night, Lesu and Manu attended Tribal Council together, and they had to vote just one person off. Lesu announced they were going to stay four-people strong and would welcome anyone from the other side with open arms. But Gavin said his tribe was going to stick to their guns as well. Wendy then declared she felt she was in the middle of the two tribes, like she didn't belong to either side. David pointed out that was good to know, but Eric was convinced Wendy was with them. "If it has to come to rocks tonight, then that's exactly what's going to happen. No one is afraid to do that," David said. Wendy then turned around and told David, "You have a spot with us," which prompted a lot of whispering to unfold on both sides. David asked to pull Wendy aside and they whispered into each other's ears. It then became time to vote and no one opted to play a hidden Immunity Idol afterwards. Probst therefore read the votes aloud in the following order: Wendy, Lauren, Wendy, Lauren, Wendy, Lauren, Wendy, and Lauren. Due to the 4-4 tie, the two tribes had to revote -- and neither Lauren or Wendy could vote. As for the other players, they could only vote for Lauren or Wendy. Suddenly, Eric ran over to Lesu and insisted they didn't want to draw rocks. David called it "the worst cocktail party ever." After everyone cast another set of votes, Probst read them to the group in the following order: Wendy, Wendy, Wendy, and Wendy. Wendy said, "It's cool, it's cool," on her way out. She asked Probst to call her "Big Wendy" and then she left Tribal Council. Wendy was excited to shower and eat a cheeseburger, but then she came across the sign that directed her to either Ponderosa or the Edge of Extinction. Wendy chose to get on a boat and head to an unknown destination.